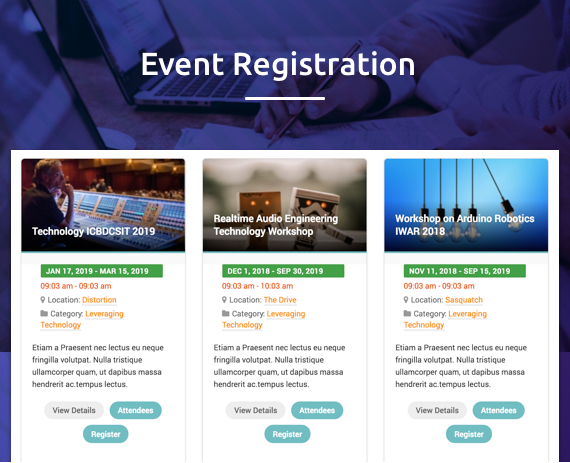 DT Register is the most powerful Joomla extension for event registration. 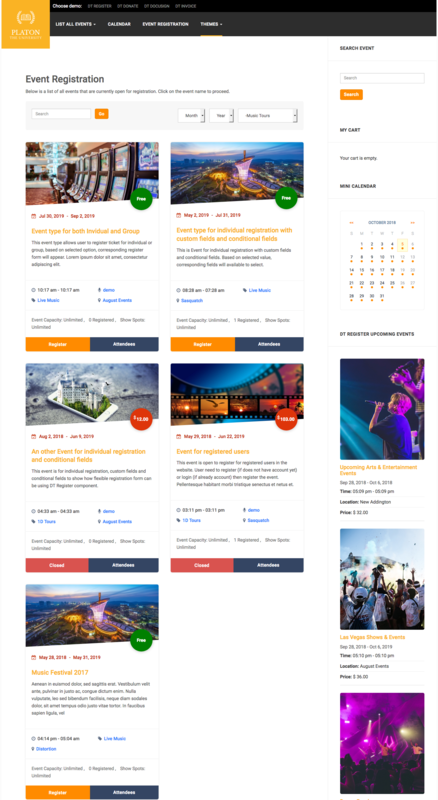 The Joomla event booking extension provides all needed features to successfully promote, book, manage and monetize any types of events your organization may offer to your customers. 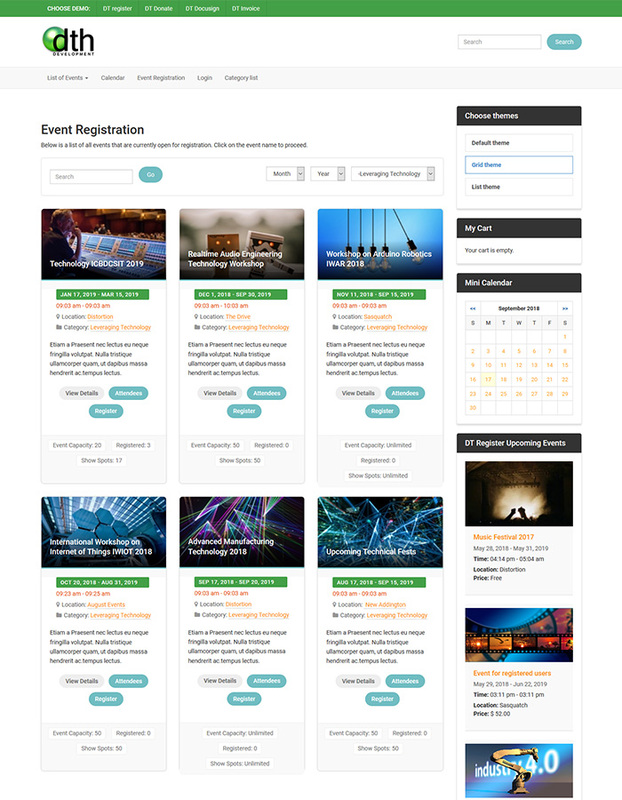 DT Register supports powerful event management system, 20+ popular payment gateways, multiple themes and templates. It is easy to setup with all core features built-in in the powerful admin panel: Location, event types, discounts, custom fields, event registration form, tax, email notification and more. PayPal (Standard), PayPal Pro, WorldPay (Europe), Quickbooks Merchant Services (QBMS), TransFirst, Sage (N. America), PayFast (S. Africa), USA ePay, PSiGate, Saferpay, iDeal (Rabobank Lite), Korta (Europe), Moneris (Canada), ePDQ (United Kingdom), PrismPay (USA), Sofort (Europe), PayWay (Australia), PayFlow Pro by PayPal offline payment options. You can also setup an event as a FREE event or handle payments later after the registration has been confirmed. Authorize.net (AIM, Accept Hosted, eCheck), Mollie, eWay, Converge, Ingenico, Paydollar, Payway, PayPal Express Checkout, Stripe. Recur events daily, weekly, monthly, and sets of dates. Update parent event can update information of all children events. Easy location creation and management from back-end. Get direction to a location/venue. Content plugin , event registration link on article. 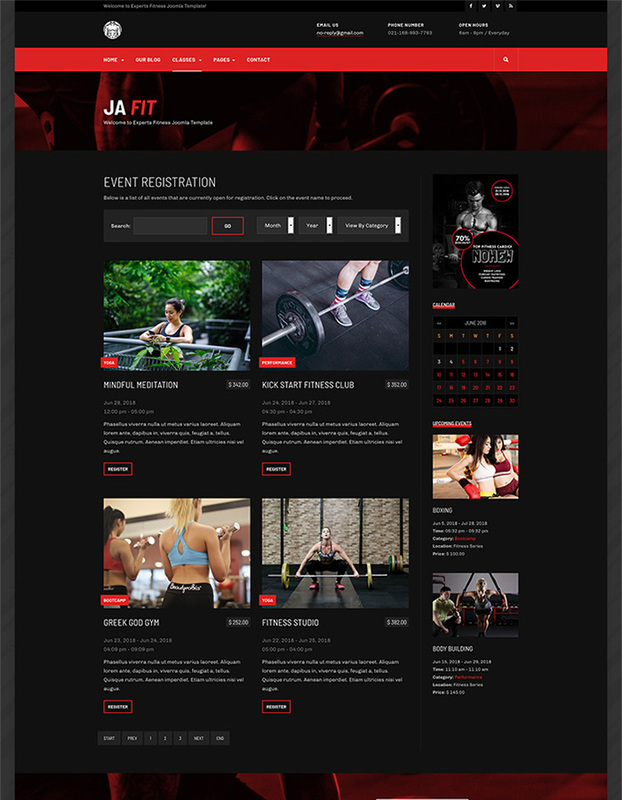 Integrate with Joomla user profile and third party extensions: Community Builder, Jomsocial. Use data stored in user profile to pre-fill registration form automatically if registrants have an existing account. There are multiple options which you can use to give discounts for your registrants to encourage them to register for your events. Coupon codes: Fixed discount amount or by percent. Early bird discount: Offer discount if registrants register before certain date. Members discount: Offer discount if registrants are members on your site (members from different Joomla user groups can have different discount amounts). Group registration rates: The more number of registrants, the lower price. Late fee: Charge additional fee if registrants register after certain date. An unique, power feature of DTH register allows you to charge registrants different registration fee base on what they choose/enter on registration form. Single selection (Radio / Single select). Example Adult : 100$, Student 90$, Children 30$. Text fee field with fee formula. Multiply value of diffrent custom fee fields to calculate final fee. Individual Registration allows you to register for one user. Group Registration allow you to register for several users in a group. With group registration rate setup, admin can give discount for group registration (the more members in group, the more discount). Shopping cart option allows you to register for different events within one checkout. Registrants can access to registration history page to view their registration history and edit information of registration records if needed. Choose to show/hide, require/not require any fields on registration form. Choose which fields you want to use for each type of registration (individual registration form, group members form, group billing form). Create additional custom fields to collect any information you want from registrants. 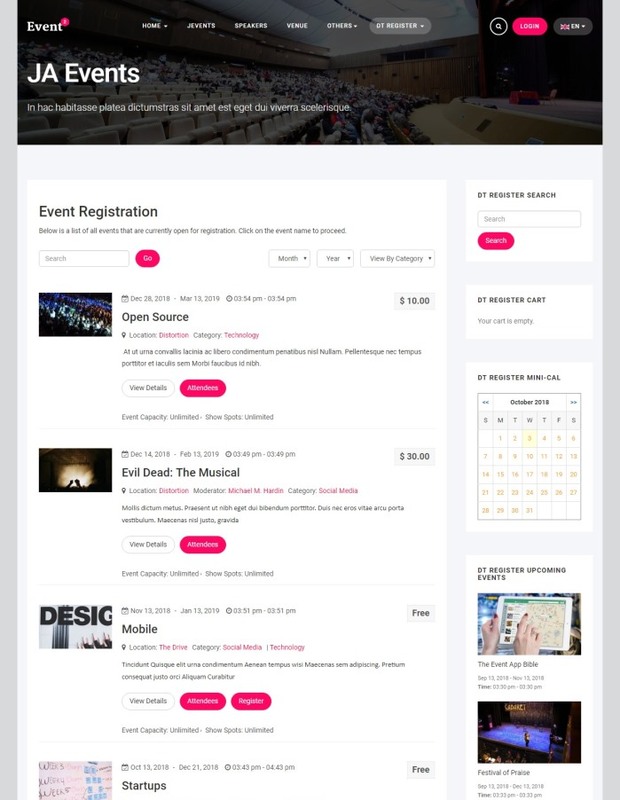 Each event can have its own, independent set of custom fields. Registration integration option allows registrants to register for a Joomla account while registering for an event. Support 10 different types of custom fields: Birth Date, Textbox, Textarea, Dropdown, Multi-Select, Checkbox List, Radiolist, Datetime, Heading(Textual), Message. Conditional custom fields: Show hide a custom field base on selected value of another custom field. Custom fee fields: Total registration fee will be calculated based on what users choose/enter on registration form. Custom field quantity: Limit each option in a custom field (Radio, Checkbox, Select, Multiple select) to a certain number you want. Option to assign custom fields to individual event. You can customize your users’ experience with DT Register in many ways. There is a front end control panel allowing you to grant permissions to Joomla users the right to manage Events that are found in the back end control panel. With calendaring functions and mapping location features you empower registrants to integrate the registration experience with their personal needs. Calendar Integration for registrants to Google calendar. DT Register Calendar view and front end searching. Google Maps Integration for locating events. Allow permitted users to Create and Manage Events from the front end. Create coupon codes to give discount for registrants. Two types of coupon discount supported: By percent or by fixed amount. Coupons can be imported/exported from/to CSV/Excel file. Tax rate can be added for each event to charge tax for registration. (Partial payment)Enable deposit payment for an event will allow registrants pay upfront fee (determined by admin) while registering and pay remaining fee later (online payment or manually at the event). Enable waiting list allows users to join waiting list of an event when it is full. Later, if someone cancels the registration, admin can move these waiting lists users into registrants. An optional add-on extension is available for creating and emailing customized invoices to registrants (DT Invoice). If you need to provide certificates of completion (even diplomas) to attendees there is an optional add on extension that integrates Docusign with DT Register (DT Docusign). Notification emails sent to administrator when someone register for an event or submit event from front-end. Confirmation emails sent to registrants when they register for an event or their registration is approved by admin (in case they use offline payment). Mass Mail to send emails to all registrants of a selected event. Batch Mail to send emails to selected registrant. Reminder emails sent to registrants (automatically by the system) to remind them X-days before the event started. Notification email sent to administrator when registrants cancel his registration. Each event can have it own notification emails and email messages if required. Add/edit registration records, add more registrants into an existing group registration. Approve offline payment registration (after receiving payment from registrants). Export/Import registrants to/from Excel, CSV file. Sending mass mail to registrants of an event or to selected registrants. Resend email (in case registrants don't receive it for some reasons). 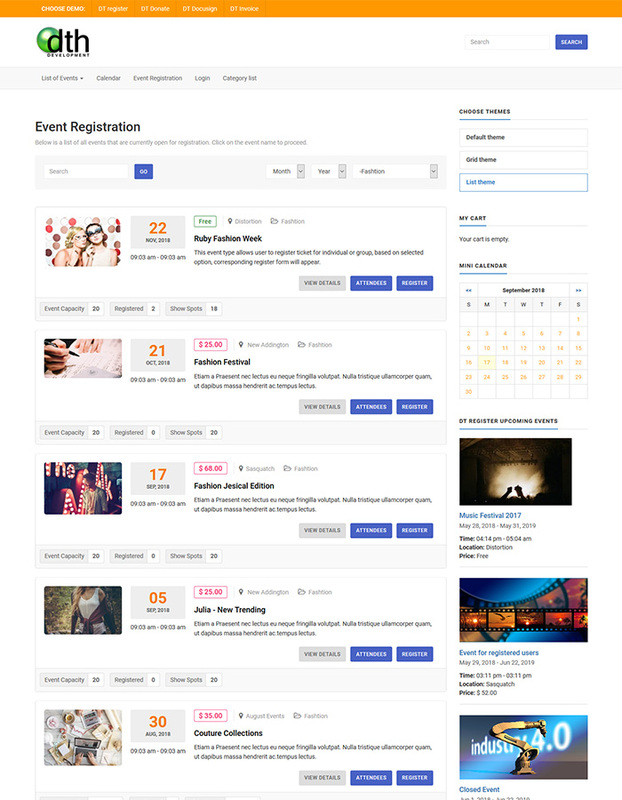 Up-coming events, mini-calendar, categories, locations, events map, search events module. Plugin to display events (a sepecific event or events from certain category) on a Joomla article. Plugin to display registration form on a Joomla article. 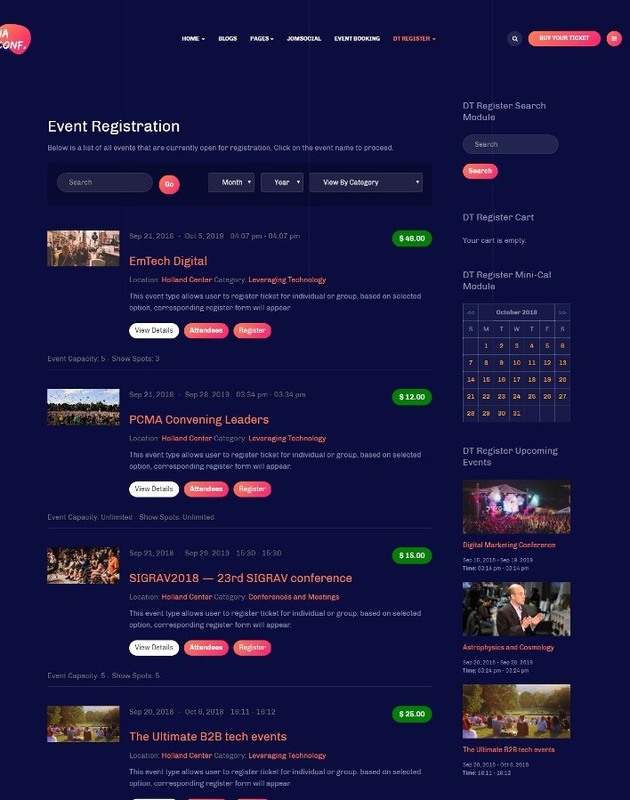 Search plugin allows searching for events via Joomla standard search. What versions of Joomla are supported for DT Register? DT Register works with all current versions of Joomla from 1.5 all the way through the current 3.x and everything in between! While we do still have a version available for Joomla 1.5 and 2.5 versions, we no longer support them. Does DT Register work with any gateway processors other than Authorize.net? Yes! PayPal Standard and some other gateways come with the component, then other gateways are available via add-on plugins. You have the option of using Authorize.net, PayPal (Standard), PayPal Pro (Website Payments Pro), Stripe, Sage (N. America), USA ePay, TransFirst, eWay, Saferpay, iDeal, Quickbooks Merchant Services (QBMS), PayFast (S. Africa), Korta (Europe), Sofort, Moneris (Canada), NetDeposit, Pay Later, Offline Manual Credit Card or all of the above. Our "Pay Later" option is for offlines payments of various types, but the offline credit card payment allows you to collect credit card info, encrypt it for security, but then process it manually offline. With Authorize.net and USA ePay, you can also use ECheck if your auth.net account has this feature enabled. Your payment options are setup globally, but you can also specify different payment options per event if desired. This means you could use PayPal account A for one event, and then use PayPal account B for another event... for example. See the DT Register page on our site for full details and the latest payment gateway offerings. Does DT Register integrate with Community Builder or JomSocial? YES! You can select if you want to use the integration or not. If you do, then registration forms will auto-populate with user's Community Builder or JomSocial profile info when they are logged in. Any DT Register field can be syned with any CB or JS field. DT Register works with all current versions of CB and JS. Does DT Register support recurring or repeating events? YES! You can setup a variety of repeating events. All repeats are stand-alone events that can be registered for directly, as opposed to one registration that covers all of the repeat occurrences. NOTE: If you choose to sync with JEvents, you can NOT sync with repeating events from JEvents. Can I organize my events in categories? Yes, you can create categories and then assign your events to a category. On the frontend, the events can be listed according to category and there is also a filter to show only the events of a selected category. In the backend, you can re-order how your categories display. Events can be assigned to multiple categories if desired, and you can have multiple category tiers. YES! DT Register integrates with Falang, which is a 2.5/3.x fork of Joom!Fish. Content elements files needed for both extensions are included in the DT Register package. Can users cancel or edit their registrations later? YES! There is a frontend panel where users can view their history, then edit/cancel records based on settings by the admin. They can also make additional payments if there is any amount due. Refunds can optionally be calculated as well. Use of this frontend User Panel does require that your registrants login so we recommend setting events as "private" so users have to login first OR using our "Auto User Creation" feature so users can create a login account at the same time as registering for your event! Can I setup events that are only available to registered users of my site? Yes! You can designate an event as either public or private. All users will see the events in the list, but if the event is private, only logged in users will be able to access the registration form. A customizable message is shown to public users to notify them of the private status of the event. As an alternative, you can redirect public users to a specified URL. This link and message can be customized per event also. In addition, you can set access levels for each category of events. This would affect who can SEE the event. An access level could be set on a category that would hide all events of that category from all users unless they are logged in and assigned to the appropriate user group. Can I setup a maximum capacity of registrants for my events? Yes! For each event, you will have the option of establishing a capacity for the event. 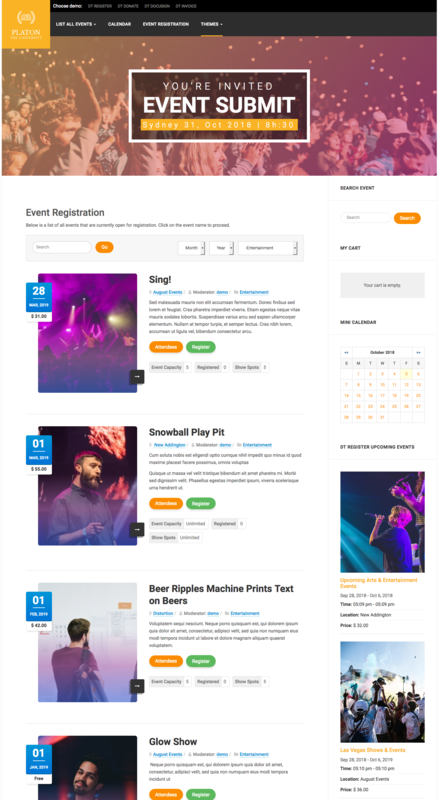 The frontend events list can show the capacity and current number registered for each event. If an event is full, the user will be taken to a page that gives them the option of adding themselves to a Waiting List in case space opens up in the event. You can also disable the waiting list and just send a user to a simple message telling them the event is full. Can I setup multiple pay options for one event? Yes! You can add "fee fields" which allow the user to alter the registration cost based upon the selections they make in your custom fields. Fee adjustments can be made to dropdowns, checkboxes and radio buttons. You can set a field option to change the registration cost positive, negative or none... and it can be a $ or % amount. 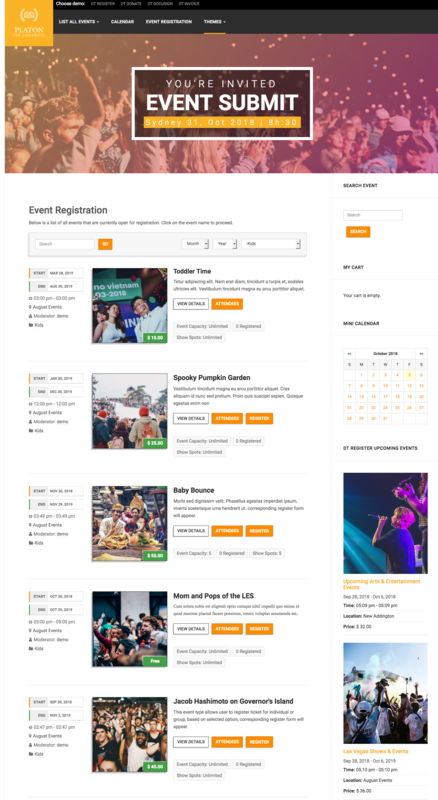 This is part of what makes DT Register the most customizable event registration solution for Joomla! These fields can also be conditional. In addition, all events have a base fee (which can be 0) with options of early bird discounts, late fees, member discounts, group discounts, etc. What other components do I need to use DT Register? NONE! You have the OPTION of syncing with the JEvents calendar, but it is not required. DT Register has its own calendar, so a sync with JEvents is not recommended unless you desire to use it for some additional feature. Can I setup DT Register to automatically process late registration fees and early bird discounts? Yes! In the setup of each registration event, you can provide a date and time for a late fee to be added after that date. You can also specify a discount based on a date and time to be applied for an early bird registration promotion. Can other users see who is already registered for my events? Yes! You can customize and enable your attendees list and choose which events you want to show this data. All fields have a parameter to designate if they will be included in a frontend attendee's list. The list can also be set to private and also link to user profiles! Will DT Register allow me to set different registration rates for individuals and groups? Yes! You can have an individual rate and then a group rate that is calculated one of two ways: either a flat rate for a set number of registrants or a discounted individual rate after a set number of people join a group. When someone goes to register for your event (if both individual and group options are enabled), the first thing they will be asked is if they're registering as an individual or as part of a group. You can also set a limit on how many people can register in a group. Can I setup an event for registration that is FREE? YES you can! Simply enter $0 as the registration fee and all payment options are bypassed in the registration process. You can also customize the form fields differently for free events as compared to the paid events. Can I customize emails to be sent to registrants automatically? Yes! You can have one default email or specify unique emails for each event. These emails can pull in data from the registration such as name, contact info, amount paid, payment method, etc. as well as data from any field that you create. There are also customizable emails that are sent when the user modifies / cancels their registrations, or when the admin modifies the status of a record. Can I export my registration records from DT Register? Yes! All registration records are viewable in either the frontend or backend records management. You can also export them into a CSV file where you select which event(s) then which fields and info to include in your customized export file. Does DT Register work with SEF URLs? Yes and No. DT Register will work fine with the core Joomla SEF, but some users have experienced issues with other 3rd party SEF extensions like sh404SEF. If you have a problem, you would need to "Skip" DT Register in the settings of your SEF component and configure it to use core Joomla SEF for DT Register URLs or leave them as non-SEF. Note that you can create custom URLs to your list of events, calendar, etc without any issue. The URLs throughout the registration process are what will not be 100% SEF. Can I control who has access to the management of my events? Yes! DT Register has a powerful and detailed permissions matrix that allows you to set which user groups have access to a list of functionalities within the component. You can also limit groups to only have access to elements (events, pay options, etc) that they are a designated moderator/owner of... so a group could have access to ALL records, or they could only have access to records for events that they are moderators for. Also, you can add individual users to the permissions matrix if someone needs permissions varied from their assigned user group. Introduce themes and overrides for efficient styling (Done).